Peter Bargh takes a look at the fascinating world of macro photography. Close up photography, or macro photography as it's technically known, is a fascinating way of seeing your subject from a totally new viewpoint. By moving in closer you start to see new details that were just a blur of colours from a distance, and the world of nature, for one, takes on a whole new look. Close up photography allows you to shoot things that you may not have previously thought possible, a close up of your diamond engagement ring, bees in the garden or flower stamens. You could also record your stamp collections for insurance purposes or home in on patterns and create textured backgrounds for your new website, newsletter or project. The list of practical and creative applications is endless. 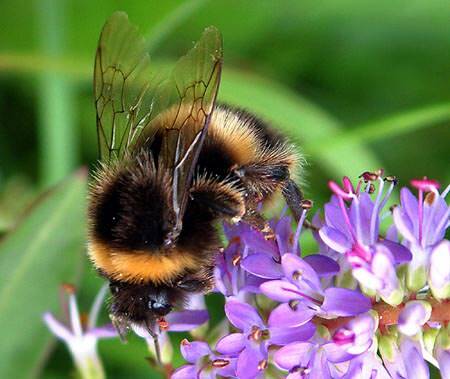 Bees make colourful subjects, especially when they're collecting pollen from colourful plants. Wait until the bee is in a suitable position on the flower and shoot. The subject reproduced on your camera's sensor is measured as a ratio of life size. For example, a camera that can record pictures at half life size means that the subject will appear recorded on the sensor half the size that it is in real life. This, of course, changes when an enlargement or print is made, as the subject then appears larger than life. To achieve macro photography your camera must have a focusing system that lets you produce sharp pictures from distances closer than 20cm, ideally closer. The latest digital cameras, such as some of the models available in Nikon's COOLPIX range, give you focusing distances of two or even one centimetres from the subject, allowing you to fill the frame with a subject that's just 15mm wide. Compact cameras have a macro setting that's usually indicated with an icon of a flower. True macro photography isn't generally an option with compacts, but they are usually adequate for taking photos of flowers and similar sized subjects. 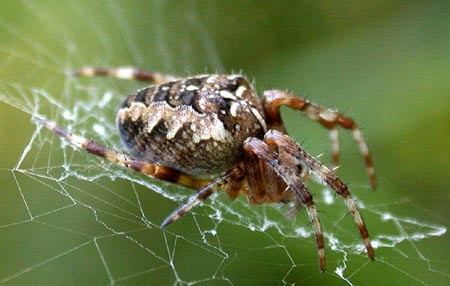 Spiders can be look quite evil when viewed close up. This one was resting on the web. My first attempts were head on which resulted in too much of the subject being out of focus. Turning to one side allows more to be sharp, even so the back legs are starting to become unsharp. Most DSLR manufacturers produce a range of lenses for their DSLR cameras that also allow macro photography. The standard zoom lens supplied with a DSLR camera will focus down to around one or one and a half metres, giving quarter life size (1:4) results, but the macro lens gives you half life size (1:2) or life size (1:1) with an extension tube. One method is to shoot from a distance and crop the photo later. This means you get a sharper overall subject, but the photo quality may not be as good because you have used less pixels, resulting in lower resolution. Move in close to the eye. 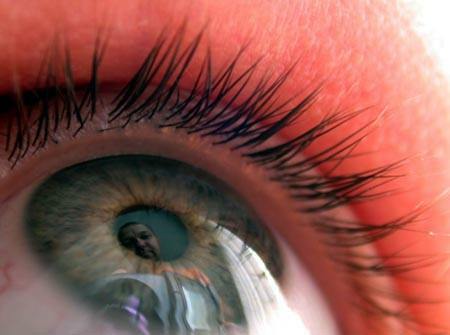 In this shot the photographer and camera are reflected in the pupil. The tight crop and low angle give a different view of the eye. The second method, and the more sensible option, is to adjust the aperture, where available, selecting a smaller number which increase depth of field. Compact cameras often have a limited number of settings with f/8 usually being the limit. DSLRs go beyond this to f/16, f/22 or f/32, for example. Reducing the aperture means less light is allowed to reach the sensor so the shutter speed has to be made longer to compensate. You are now faced with a dilemma because making the shutter speed longer increases the chances of camera shake. If the subject is static all you need to do is mount the camera on a tripod or rest it on a steady support such as a wall, pile of books etc. If the subject is swaying in the wind you could create a wind shield or alternatively, add a spot of flash or try again on a wind-free day. If the subject is moving you should increase the shutter speed. You may need to increase your ISO to allow a faster shutter speed or smaller aperture to be used. Sometimes this can mean images will have more noise (a grain-like appearance) but the overall shot will be sharper with more depth of field. 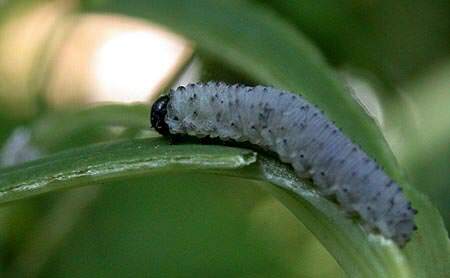 This caterpillar was taken in leafy shade. The shutter speed was down to 1/15th and there was little depth of field. To overcome this the ISO setting was adjusted from the ISO 100 to ISO 800, which has resulted in a grainer shot, but at least it's sharp. Alternatively, take your chances using a wider aperture with less depth of field. Some photographers do purposely go for a shallow depth of field, allowing only one part of the image to be sharp. Flowers, for example, can look excellent when this technique is applied. If your camera has a limited close focusing you could zoom out to the telephoto setting to increase magnification. Beware though, depth of field is reduced further. Another problem you may encounter, especially when using a camera with extremely close focusing capability is that the camera is so close to the subject that it can cast a shadow. Try to move around to a suitable viewpoint allowing the light source to continue to illuminate the subject. Flash can be used but only with cameras that have off camera facility, so the flash can be positioned away from the camera in a suitable position allowing adequate subject illumination. DSLR manufacturers provide a series of dedicated guns for their DSLRs and digital cameras, including ring flash that gives more even coverage at short ranges. Using the flash that's built into your camera will result in unpleasant looking images that can appear washed out. 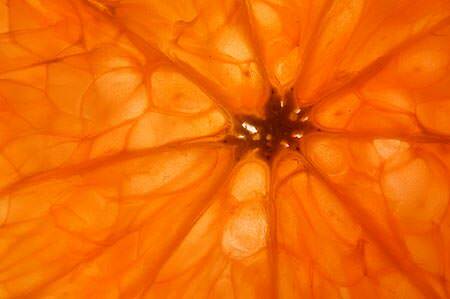 This photo is of a slice of orange placed on a lightbox to backlight the subject. If you do need more light in your scene, reach for the reflector before picking up your flash gun as a white or silver one can be used to throw light back towards the subject and fill in the shadows caused by overhead illumination.